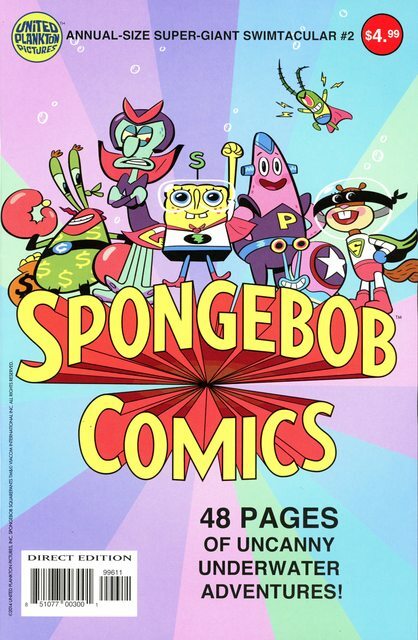 SpongeBob sees a new issue of Mermaid Man and Barnacle Boy comics and battles Squidward for it. Mermaid Man advertises a barrel of seven different kinds of life-size plankton figurines. Mermaid Man and Barnacle Boy in The Challenge of the Rustler! When Barnacle Boy accidentally switches brains with a seahorse, he must find a way to switch back to normal. The Coolest Collection in Town! Mermaid Man advertises the Bucket of Water of the Month club, where you receive a bucket of water from the location of Mermaid Man's thrilling adventures. SpongeBob and Patrick try to become heroes that help people with everyday problems. Mermaid Man and Barnacle Boy advertise their educational comic books. Bikini Bottom turned into a league of superheroes when they are threatened by the villain Gene Scallop. Mermaid Man advertises an assortment of themed products for sale. I Shall Destroy All the Civilized Plankton! When Plankton steals a Krabby Patty, it's up to Dustar to stop him and teach him a lesson not to steal anymore. Random Fact: The story "I Shall Destroy All the Civilized Planktons" is a spin of Fletcher Hanks comic "Stardust".